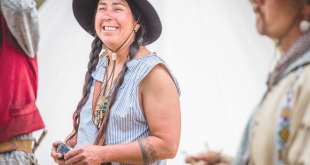 When I was born, my parents stopped going to church and stopped eating meat,” Peace Wheeler says, smiling with a glint in her eyes. Her father, Bill, was born and raised in Gunnison. Her mother, Joey, was a Boulderite, and they lived in Crested Butte from the late 1970s through the early ‘80s before moving to Paonia. In fact, Peace had such a bad experience in first grade that her mother bused her to the Hotchkiss schools where, Peace says, the kids were far nicer. Even though school was socially easier for her in Hotchkiss, the family missed Crested Butte and finally returned in 1996 when Peace was eight. “They loved [Crested Butte] and wanted to raise their kids here. I’m forever grateful they made that choice,” Peace says. Her fourth-grade class was the last to be taught in the old school (where the town offices are now) and the following year the kids moved into the brand new Crested Butte Community School. Peace graduated in 2005. Following in her older brother Justin’s footsteps, she volunteered with the Crested Butte Fire Department, having already earned her Firefighter 1 certification at the age of 18, and then getting certification as a S-130/S-190 Wildland Firefighter via a nationally standardized test that allows her to fight forest fires both here and out of state. She went on for even more extensive training as an EMT-B with an IV certification. After 12 years, Peace is taking a break from her firefighting work with the local department to enable her to pursue other things. During her fire department years, Peace was also working for Crested Butte Mountain Resort as a lift op and ticket checker initially, and also as a ski instructor for a couple of seasons. 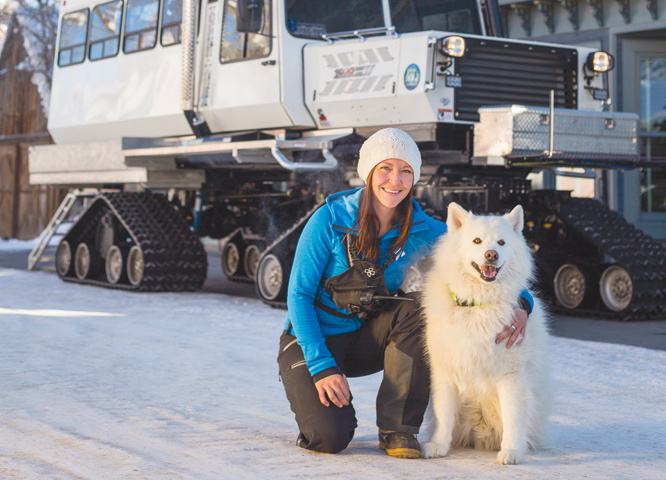 But when a spot on the snowcat grooming team opened up in 2010, Peace went for it. The next season, Peace graduated to grooming, but her very first night up was challenging. “There’s a specific tree up there now named Peace Tree,” she cringes with a giggle. “There’s a big chunk out of it. It was my first shift, and on the graveyard shift, and it was a crazy white-out storm where we got 12 inches that night. I couldn’t see. I was following the shift supervisor, Chad Kaiser, who was showing me the route, turnaround spots and better ways to efficiently groom the slopes,” Peace says with a big sigh. “We were going down one of the cat tracks through the trees. He was in one of the smaller cats and I was in one of the bigger cats and he didn’t realize that the bigger cat wasn’t gonna fit…” Peace trails off, leaving the visuals and the grinding, scraping bang of a cat slamming into a tree to your imagination. Currently Peace is a fill-in groomer with CBMR because she also works at Irwin Guides for the Eleven company. It’s her second season with the latter, driving the Tucker, the big white beast, from Irwin’s office on Belleview up to the Irwin slopes on Scarp Ridge. “I drive to the movie cabin, drop everyone off and hop into the alpine cats to take them up to various locations on Scarp Ridge,” says Peace. Unknowing tourists and visitors don’t understand the training and expertise it takes to be one of the elite fleet who can qualify as a cat operator. In 2007, back when she was a youngster of 19, Peace and her brothers Justin and John bought the Forest Queen bar and restaurant business. “Dunno why,” she says. 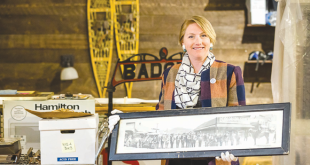 “We kind of wanted to secure something as a family business.” Shortly after, her parents bought the building to secure the business location for them. As even loving siblings do, Peace admits, “We fought a lot because of the business and here I was only 19 and not sure what I was doing as a bar and restaurant owner. We ran it for a year, but it came to a screeching halt with my brother John’s sudden death,” she tells of the heartbreaking loss of her big bro on January 7, 2008. “He was my roommate at the time. I was out shoveling the snow in our walkway. It was that epic year where it never stopped snowing, it was the year we had to tunnel to our houses. “John was getting ready to go to the Queen for his bartending shift. He was the best bartender, he was such a social guy, and it was the highlight of his day to get to talk to people,” Peace describes. “My brother Justin went into the house to pick him up for work and found him unresponsive. We called 911. Because we’re all really close in the fire department they knew it was my house. My friend Cory Tibljas who was on the department but wasn’t even on duty was the first one to arrive. He knew it had to be John. They tried, and almost revived him, but they couldn’t maintain it. Officially he had a heart attack. My life changed a lot. It made me realize that you can’t take things for granted, especially relationships and friendships. We, as a family, have struggled a lot with it but it’s made us stronger, and weaker, at times, but we’re constantly reminded that we have to stick together. It’s made my bond with Justin stronger. It was hard being back in that building. It’s still hard.” They closed the Forest Queen business following the loss of their brother. 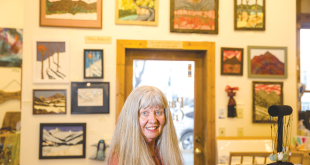 Peace is still involved as a co-owner of her family’s business, Crested Butte Rental Center in Riverland. “We all do everything. It’s kind of a nutty operation. We have construction equipment, everything from small hand tools to big boom lifts and bobcats and the other side of the business is weddings and special occasions, renting everything from tables and tents to PA systems and lights—everything except the wedding dress,” she laughs. Peace spent five months there during the New Zealand ski season, running their grooming cats. “I’m going back again this year but I’ll leave it open-ended as to whether I go back after this because it’ll be five consecutive winters with no summer.” Peace explains that all of South Island of New Zealand is exactly like Colorado but more drastic with its sea level to soaring heights mountains. “It made me really homesick when I got out to travel there. I made a lot of friends but it was hard not being around my family and close friends here. Although in general it was positive for me, once I bought the plane ticket it challenged me personally to get out of my comfort zone,” and as a bonus, there are no trees to run into with her snowcat down there. Peace enthusiastically professes her love for her home, which will always be Crested Butte. “Sometimes I forget to remember that we’ve got it so good here. Getting out and traveling makes me realize that this is absolutely where I want to live but I know that I still want to travel a lot. I’m going to Japan in March to go skiing, because I’ve always wanted to ski there. I want to go back to Cambodia,” where she went just before leaving for New Zealand.